The West is the course that everybody rushes to play when visiting the Wentworth Club, but the East is more enjoyable for the average player. It is also more sandy, intimate and charming. This was the first course Harry Colt built at Wentworth and it was born in 1924, two years earlier than its bigger and brasher younger brother. The second unofficial match between the American and British professionals, "which was the begetter of the Ryder Cup," wrote Bernard Darwin in Golf Between Two Wars, took place on the East course in 1926, one year prior to the inauguration of the Ryder Cup. The match heralded a landslide victory for Great Britain (GB 13½, USA 1½). In the foursomes, Abe Mitchell and George Duncan beat Walter Hagen and Jim Barnes 9 and 8. The first unofficial match took place in 1921 on the King's course at Gleneagles. The East was also the venue for the inaugural 1932 Curtis Cup which the USA team won 5½ points to 3½. In terms of length, the East is relatively short, measuring 6,200 yards from the back tees, but it’s an exceedingly pleasant walk on the springy turf and the lowly par of 68 will make playing to handicap a serious challenge. There’s only one par five, but there are five par fours measuring in excess of 400 yards. It’s the East’s collection of five short holes that stand out, they are simply outstanding par threes. Only the delightful West Sussex course at Pulborough can perhaps claim to have a finer assemblage of short holes. The East course occupies the central area of the Wentworth estate with the newer Edinburgh course now sitting on the eastern side. It is a very special and intimate experience playing golf on the East, as many people will already know. The enclosed woodland setting confuses your sense of direction – where only one hole is generally in view and they seem to zigzag all over the place. It always comes as a pleasant surprise when we reach the halfway house where we can have a drink and draw a deep breath before we take on the 7th, an appealing, but challenging, long par three. It’s a shame the West overshadows the East but it’s understandable that golfers want to play the championship course. There is obviously only one thing to do – get here early and play them both. This was the first of the 18-hole courses that I played at Wentworth last week and, for me, it was my favourite layout. The East was the inaugural Colt course to be laid out on the property in the 1920s and it captivated me right from the start. I didn’t expect to find such a rise and fall in the landscape during the round and I also wasn’t prepared for the seclusion of each hole, with nearly every tree-lined fairway (holes 10 and 14-16 apart) only revealed upon arrival at the next tee box. 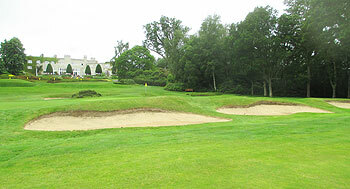 Special holes include the two par threes on the front nine (the 4th with its six intimidating bunkers running down the left side of the hole, the 7th with a diagonal dyke cutting across the fairway), whilst the eight cross bunkers built into a ridge at an angle to the home green provide a very intimidating hazard at the 18th. I liken the East course to the Queen’s at the 54-hole Gleneagles Resort as, for me, it’s a more club golfer-orientated layout to savour whilst the big boys go bashing about on the other courses next door. I agree that the East Course is a lot more player friendly then the famed West Course. The bunkers are not as severe yet it's still a great test of golf. What an amazing golf resort! This is a super course but perhaps slightly over rated due to it being at Wentworth. That said there are some wonderful holes that offer the average golfer a chance of par or birdie compared to the beastly West course here. I found the course in very good condition, but the greens were a little slower than the Edinburgh which we played in the morning. There is a run of excellent holes from 11-16 with some elevated tee's over looking vast swathes of heather, stay out of this at all costs! A classic Colt layout, but for me the Edinburgh course is a better track. Played the course last year. Good course and playing at Wentworth is always fantastic. However, if it were a course in isolation and not part of the larger 'Wentworth Experience' benefitting from its incredible facilities, I would struggle to see it being rated so highly on just the merits of the course. By way of example, from purely a golfing perspective, Royal Wimbledon is a better course. Played this course yesterday in a customer golf day - what a treat. Having played the other 2 courses at Wentworth this was a pleasane experience. The greens were excellent (very quick!) and has some strong holes and is in great condition of course. Would love to come back and play it again. Played on a corporate day last weekend and was very impressed. Great greens, nice fairways and lovely layout. Quite a tough course if playing in 30 mph winds like we were! Not as long as the West but thats probably no bad thing especially with the wind. Clubhouse its great too. If you get the chance play it. Lovely course. Played the East course recently on a beautiful autumn morning and what a treat it was, like most things at Wentworth it’s got style and class. The West course may get all the TV coverage but it’s tough, almost too tough for the average golfer to enjoy. That’s the beauty of the East course, it gives you all the style and quality of the West Course but you have a fairer chance of playing to your handicap. Enjoyed the East recently - best way for me to describe it is that it is a mini version of the West. Definately easier and more suited to the handicap golfer. Fairly short in places - had many less than a full wedge into the greens. Really enjoyed the round and the quality (like every thing going on at Wentworth) is top draw. Do add the East to your list of courses wanting to play as in its own right it is a memorable course played in the beautiful leafy Surrey Wentworth estate - but this for me is not as good as the West. The East course lacks the fame of the West, but in its own right it's a little beauty.Shorter than its illustrious counterpart but still as tight, just as pretty and a lot less busy. It's hard to believe when you play it that there are two other courses so close by. Don't rush to Wentworth and make straight for the West, this course is equally worth the money. I'd rather play the East than slog round the West - it seems more natural and definitely prettier. Par threes are superb.